-In wide areas look for opportunity to overlap. -2 v. 1 scenarios in the game. Speed of overlapping run. -Triangle in the middle 4 yd each length. -Other half outside circle with a ball except 1 or 2 without. 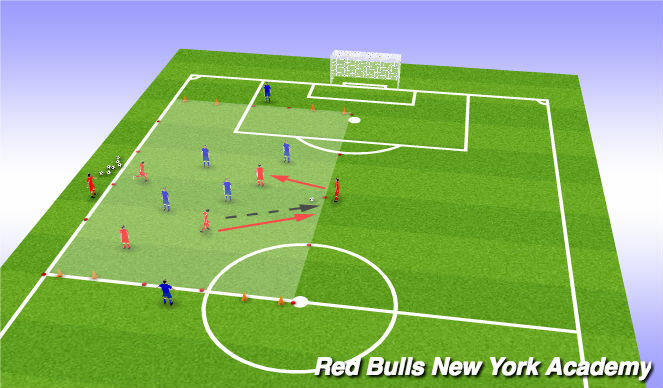 -Players in the middle look to move into a "window" within the triangle to receive the ball from an outside player. Receive and pass to an open outside player. -1 minute rounds, then switch inside with outside players. A. Double pass. Rotate all players rounds of 1 minute. B. Overlap. Player 1 passes to player 2. Player 2 holds ball and 1 makes overlapping run to receive ball. 2 replaces 1 starting position after overlap. 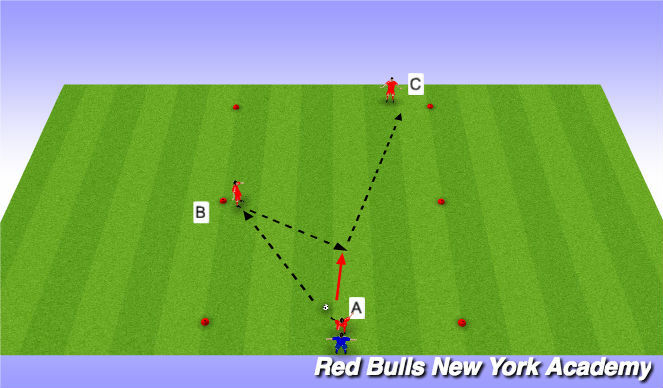 1 passes to open player on outside then finds new ball to receive and hold for next overlap combination. Approx 10x20 area. 4 players. 1 ball. All players begin down the centre line of the area. B begins by checking to either cone. Start without defender, then add blue player as defender once pattern unerstood. The defender follows staying goalside. B sets the ball back for A who plays a first time pass through to C.
- Quality of pass to C - Hit with pace to beat the defender. (1). Non-opposed. Players get used to the pattern and movements. (2). Semi-opposed. Add blue player as defender. Defender becomes B and A becomes defender. B replaces C&apos;s position, C replaces A. Organization: 40x50 yd area. 2 teams of 6. Instructions: 2 players from each team play as target players and can only go up and down touch line. "Try to penetrate defense by dribbling or passing around them." Use target players to keep possession. Count passes out loud. 7 passes consecutively = 1 point. (1). Recognition of not being able to play forward. Compact defense? (7). In wide areas look for opportunity to overlap. (8). 2 v. 1 scenarios in the game. Speed of overlapping run. Progressions: (1.) Pass to a target player and replace that player&apos;s position. 2). If team completes 5 passes, target of their color joins the play to add numbers up. -1 Balls- restarts from coach at half field- first team to get organized gets ball.